You may have heard that AR Modular RF has created the lightest, most compact 20-watt booster amplifier kit on the market. Now you have a chance to see it in action at the 2012 SHOT Show. The KMW1031 Amplifier Kit will be on display at two booths during the 2012 SHOT Show, January 17 – 20, Sands Expo Convention Center, Las Vegas, Nev. The KMW1031 Amplifier Kit includes everything needed to boost radio signals, all in one convenient package. 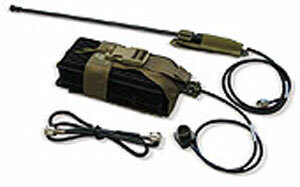 The kit includes amplifier, 30 – 512 MHz antenna, RF cables, battery cable and tactical vest pouches for both the amp and antenna. The entire kit weighs less than 2.5 lbs.